Are The Beatles the greatest band in history? Let's just say that John, Paul, George, and Ringo are...very, very good. A Hard Day's Night, their feature film debut, is equal to their music: a brilliant, fun film that captures the charm of our four Liverpool lads and spoofs both the madness and mayhem that Beatlemania brought. This was when The Beatles were fun and unabashedly so, before they went psychedelic, before the Maharishi Mahesh Yogi, before John was shot and George was consumed with cancer. Both as a light comedy and a document of its time, A Hard Day's Night is a film that even those who know nothing of music will think, "These guys could PLAY"! Chronicling the lives of The Fab Four as they race to make a television appearance (whilst avoiding their crazed fans), the Beatles all try to keep their heads together all while keeping a wary eye on Paul's grandfather, John McCartney (Wilfrid Brambell), who is a 'clean old man'. After the chaos of boarding the train, they find their time in their hotel a bit restrictive, but their manager does his best to keep them in line. Once they make it to the BBC Studios, Grandpa John talks Ringo, who is feeling left out of things, to wander about and find some freedom. Needless to say, Ringo goes out...as the show gets ever closer! Eventually, after an arrest of both Ringo and Grandpa John, all works out for the best as The Beatles entertain their fans with their songs, giving a respectful bow at the end. I think A Hard Day's Night is simply a great way to introduce The Beatles to anyone who hasn't heard or heard of them. I'm sure there must be someone out there. We get the lads as I figure they probably were, for as far as I can tell, they were playing themselves (or at least, remarkable simulations of themselves). Alun Owens' screenplay gives us such delightful moments of cheeky fun and bravado. When facing against a hostile older gentleman on the train, he snaps at them, "I fought The War for the likes of you". I think it was either Ringo or John who replied, "I bet you're sorry you won!" Another of the great and fun moments of A Hard Day's Night is when The Beatles endure a press conference. Long before the term 'mockumentary' took hold, I figure director Richard Lester was creating it, as the boys go through the inanities of answering the same questions over and over again. Ringo's cheeky replies ("I'm a mocker", when asked whether he is mod or a rocker) and Paul's repetitive answers all lend this sequence a light, breeze manner that runs throughout the film. Of course, if you think about it, it is the music, the extraordinary music that is the real highlight of A Hard Day's Night. I remember quite well when I went to the Plaza Classic Film Festival when A Hard Day's Night played, and Beatlemania was still in full swing. The audience was happily singing along to the songs, and while I don't think anyone actually screamed like the fans in the concert scene (and even slightly muted they were still strong screams), everyone had a good time. A Hard Day's Night captures the fun of being young, foolish, crazy, and in The Beatles' case, extremely, exceedingly talented. 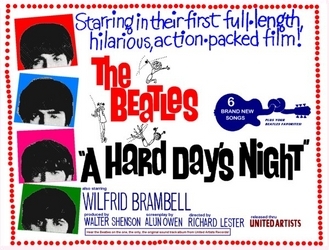 A great soundtrack, with a fun a breezy manner, A Hard Day's Night is a delight from beginning to end. She Loves You...and We Love You, Too.